Virtual Reality is increasing in popularity with a projected 171 million users in 2018. Although VR has made some great strides, there are still plenty of areas of exploration and innovation to be examined. With these areas of research there are people dedicating their time on all fronts pushing the boundaries and bringing VR outside the box. It is this type of ethos that creates breakthroughs in using technology to connect people. This exploration last year took me to the ix symposium 2017 entitled Embodied Spaces where they focused on making virtual reality a broader full body experience. 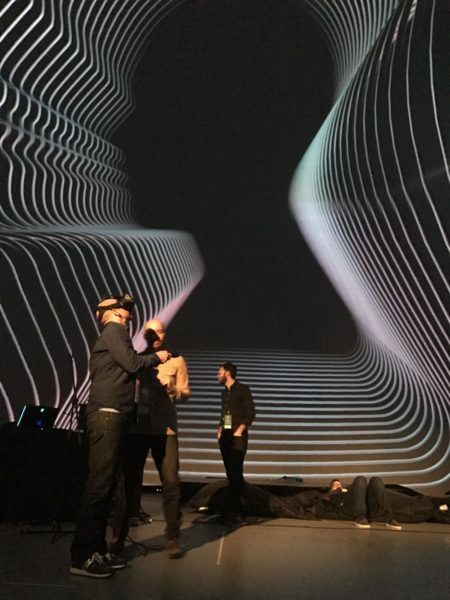 The ix symposium put on by Société des Arts Technologiques gives a platform for innovators and creators to showcase how they are leading in areas of development of VR, dome, and other experiential uses of technology to embody the experiences. For the sake of this blog post, I will focus on VR. VR, like many things excels in certain areas and lacks in others. The places where VR excels are in gaming, previsualization, helping reprogram tramas (such as PTSD), and demonstrating and proving concepts. Others are exploring uses for movies, artworks, virtual travel, and meditation. We are still trying to figure out this technology and see where it lands. Some have made it their mission. One researcher in particular, M. Eifler, caught my attention. She had begun using VR years ago and was extremely vulnerable to motion sickness and fatigue. She spent the next few months building a yoga regimen for building tolerance for VR. She was able to build her tolerance from just 3 to 5 minutes to 5 to 6 hours. She would often spend a large portion of her work day in VR having meetings and working. In the search for movement solutions in VR, many people have been creating all types of contraptions to heighten the body mind experience. Movement should become a lot easier with new wireless VR headsets, but one still wants to be safely moving in real space while moving around the virtual environment. One solution I tried at ix was the treadmill. There are several VR treadmills out there that offer safety for a single user experience. For my treadmill experience, I had to sign a waiver and there were a couple staff nearby watching to make sure I didn’t fall off. My favorite part in the game I was immersed in had me walk across a beam with images of nothing but clouds on either side. I quite literally began to wobble a bit as I tried to find my “balance” on the beam. Of course I knew I would not fall off, but part of my brain was convinced that I needed to balance on the imaginary beam otherwise I’d fall to my demise. More recently, I sat in a robotic pod. My eyes covered with VR, sound coming from speakers in the pod located near my ears, and a joystick in either hand as I rode a roller coaster and shot at dragons that looked a lot like bats. The experience was 8 minutes long and as the pod moved up and down, left and right to mimic the visuals of the roller coaster. It was an intensified version of my previous VR experience. Admittedly, as a person who can proudly stand up while wearing VR and experiencing a roller coaster ride, and loves the thrill of jumping out of planes, I was on the verge of feeling sick from too much movement. But what if you combine the dome and VR? ix touched on this phenomenon with demonstrations of navigating VR with an audience viewing the user experience. We also witnessed what it could be like to use VR to create 3d objects and design while being voyeurs in the dome. Our team here at Alt Ethos has created VR experiences for a variety of applications including pure entertainment, new concept design walkthroughs, and dome previsualization. We look forward to developing content and experience solutions to help people with PTSD, meditation, and finding empathy for others. One of my favorite places on the planet is the Société des Arts Technologiques. For years I have admired their vision and dreamt of building an amazing facility for research and exploration of experiential media. Of course, ix is going to be one of my favorite conference. And maybe it’s because I spoke at the very first one in 2014 under the theme of “Valorization & Sharing”. SAT and its founders, Monique Savoie and Luc Courchesne, helped inspire me to start my two organizations, Alt Ethos and Denver Arts + Technology Advancement. Montréal is amazing. It’s one of the most supportive cities for arts and technology. I’ve witnessed some of the most beautiful street art in Montréal including the 21 Balançoires or musical swings. And on a nice day one can go to the park and hang out people playing music, drinking beer and smoking weed just enjoying life. I’m impressed with the symposium and what they deliver year after year. This year’s theme is The Conquest of Reality and runs May 29th through June 2nd. Each year I have attended has been one of the best times connecting with old people old friends and making new ones. And of course for me there’s the organizers and the founders of society and technology that I get to nerd out with and catch up one life. I know how hard they work and how hard they have worked in I’m following a similar journey working to establish something similar here in Denver. 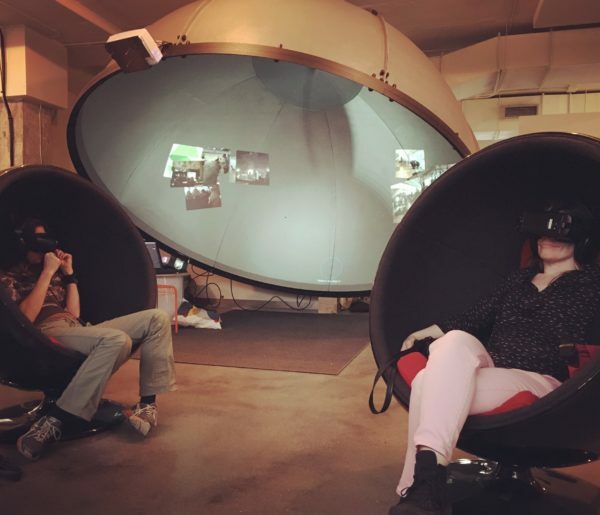 If you are curious about trying VR, come join us at our open studio June 1 from 5pm to 11pm at Prism Workspaces 999 Vallejo Street #30, Denver CO. If you have a VR project you would like to actualize, please contact us. We are happy to help. If you are interested in learning 360 content – check out MORPHOS 360 workshops.